Deanna Thompson flew in from North Carolina to ride Friday and Saturday. We had two days of intense training. She felt that she had lost her seat and was having difficulty riding sitting trot when extending across the diagonal. It only took us one lesson to fix her seat! I took away her stirrups and aligned her body. I had her practice extending on the diagonals and to keep her seat ahead of the horse; so as not to be left behind as the horse pushed off in the more forward stride. By the end of the lesson she looked like a pro. I told her, it doesn’t get better than that, as she was able to stay with the horse stride after stride. With that behind us, I spent time teaching her to be more sophisticated at engaging the horse from the hind legs and lifting the frame. She was able to get better timing with her seat. We were able to get her hands in a better place for upper level work. She worked with three different horses, Mirage, Galileo, and Victress. Victress was her favorite. Victress has the largest stride and can rise into the air as she travels across the diagonal. Deanna was happy to be back on her as she had shown her two years ago at third level and got a qualifying score with her. I was so pleased as I was able to teach her things I hadn’t been able to teach her in the past. She was really ready to go forward in her training and she did. Her plane left today and she will be back training horses in the Carolina’s and I’m anticipating great success on her part. She will be keeping in touch and coming back for more training in the summer with the hopes of training on Victress and showing her. Left to right: Top row: Carolyn Rose (director) Beth Ann Regaglia, Morgan Smith, Lydia Rose, Pam Catell, Caitlin Britilli, Sandra Beaulieu, Robin Britilli. 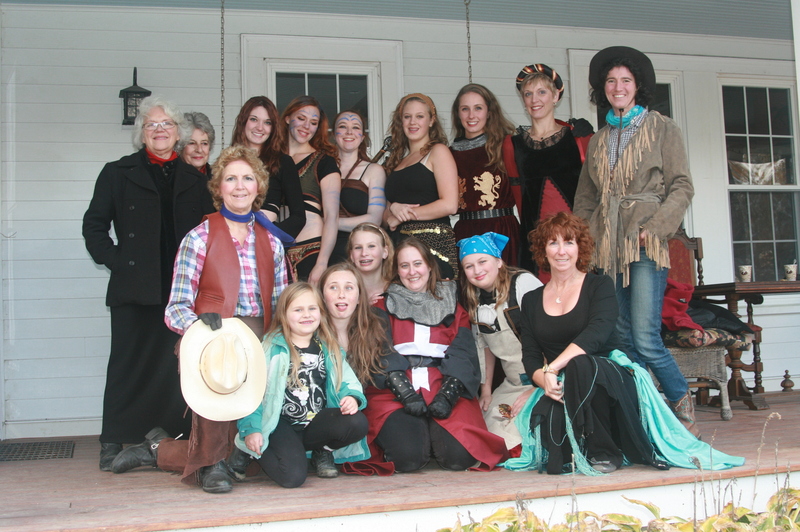 Second row: Marjorie Kasten, Eden Preble, Nellie Myers, Kaylee Clark, Angela Bonacasa, Chelsea Nichols, Wendy Graves. The theater was a smashing success as horse and girl (Lydia Rose) brought the audience to tears as they connected to the music and worked at liberty. The flag girls, galloping through the arena, horse and riders with swords ride to the pirates music, as swash buckling girl sword fighters, fight amidst the sword fighting riders that creates choreographed mayhem to each note. Our audience gasped, at the danger before them. The mare and foal rode to a piece from spirit, a man marveled at how well the foal knew his music. A great time was had by all. We are back to the drawing board with plans for our spring performance. Check our website www.isaacroyalfarm.com for upcoming events.